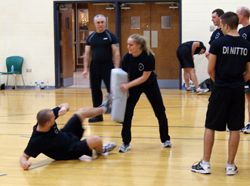 Print the Police Academy Training Program Application (PDF) or call the Center for Adult and Continuing Education to have it mailed to you. Review the Application Checklist on the first page of the application. Submit all items listed on the checklist by mail or in person. The address is listed on page one of the application. Final acceptance of each cadet is dependent upon an interview with the Director of the Police Academy. Once your full application has been received, the Director will contact you to set up an appointment for an interview. If approved by the Director, acceptance is finalized upon receipt of a $500 non-refundable tuition deposit.